Rabi Ghosh (24 November 1931 – 4 February 1997) was an actor from India. He is best known for his comic roles in Bengali movies, though his versatile acting talent has stunned viewers and critics alike in various kind of roles. He was a regular in Satyajit Ray cinemas. 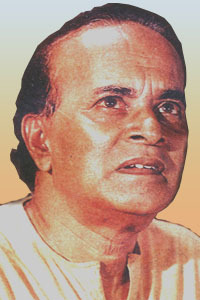 Rabi Ghosh was a renowned actor in Bengali theatre and TV as well. He was born on 24 November 1931 in Kolkata. His real name was Robi Ghosh Dostidar. In 1949 he completed his matriculation from the South Suburban Main School. After completing his intermediate in science, he joined the Asutosh College for graduation. He used to work in Bankshal Court from 1953 to 1959. He got married to actress Anubha Gupta. After her demise, he re-married Baishakhi Devi on 24 November 1982. Rabi Ghosh’s role in the play “Angar” was noticed by director Aurabinda Mukhopadhay. Robi made his debut in a small role in his film “Ahoban” in 1959. His breakthrough was in Tapan Sinha's Galpo Holeyo Sotti, and his role in Satyajit Ray’s Goopy Gyne Bagha Byne (1968) became a landmark in his career. Abhijan (1962), Aranyer Din Ratri (1970) Hirak Rajar Deshe (1980), Goopy Bagha Phire Elo (1991), Padma Nadir Majhi (1993) are some of his memorable movies. He was also a noted theatre personality who was a student of Utpal Dutta’s Little Theatre Group. He had also traveled extensively abroad for his performances in Berlin (1969), Mauritius (1988), USA and Europe in (1995). He also directed the movie “Nidhiram Sardar”. In 1970, he also participated in the world-famous Berlin Film Festival as the lead actor of Goopi Gyne Bagha Byne. He was the founder of the theatre group “Chalachal”. In 1960 he was awarded Ultorath Award for his outstanding performance in the play “Angar”. He died on 4 February 1997.